The Right Contact Lens Choice is No Accident! Making good decisions about wearing contacts is easy once you have all of the information you need. It all begins with a thorough eye exam and a complete understanding of your unique eye health. If wearing contacts is a healthy option for you, your prescription and your specific contact lens interests are investigated next. Once these elements are understood, the doctor can determine which contact lens options are best for you. 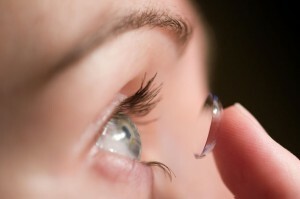 There are hundreds of different types of contacts available today and new styles are constantly being developed. There are contacts designed to replace your glasses, contacts for sports, contacts for certain occupations, contacts for special events, contacts to protect your eyes, contacts for hunting and shooting and the list goes on and on! Because everyone is different, there is no one single brand or model of contact lens that is best for everyone – just like there is no style of sneaker that everyone can wear. Don’t be misled by advertisements claiming that one particular contact lens is better than all the others. Successful wearers are able to maintain clear vision and eyes that are comfortable and natural in appearance. They achieve success with safe care methods combined with contacts that fit perfectly and meet their specific wear requirements. If you’re thinking of wearing contacts, or if you’ve worn contacts and want to continue wearing them for many years to come, thorough attention to your eye health and expert product selection are the keys to long-term success. Our office stocks thousands of contacts in a large variety of prescriptions for patients of all ages and lifestyles. For convenient answers to all of your questions about today’s new contact lenses, call or visit us to discuss your options.